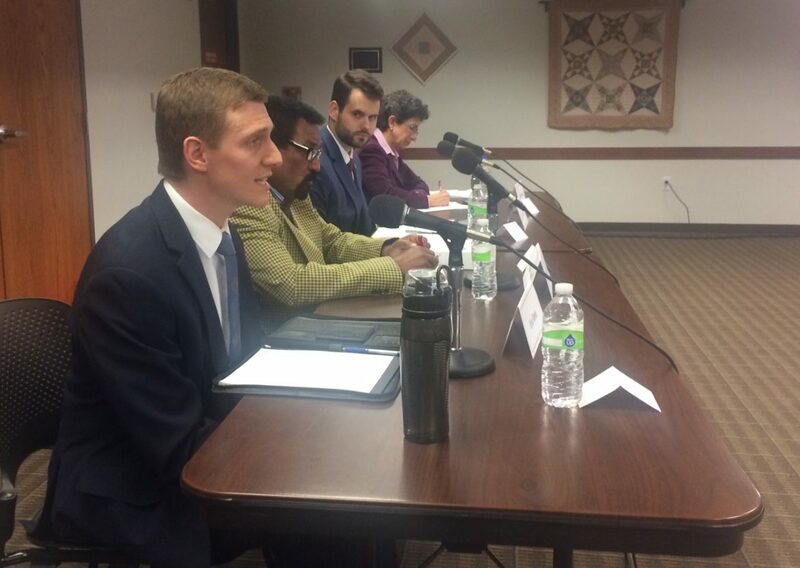 The four Democratic candidates for Iowa's District 37 Senate seat vacated by Bob Dvorsky (D-Coralville) speak at a public forum in Coralville on April 9, 2018. Left to right are Eric Dirth, Imad Youssif, Zach Wahls and Janice Weiner. The Johnson County Task Force on Aging hosted the forum. The eight candidates for four contested Johnson County, Iowa, seats in the Iowa General Assembly have been invited to participate in a candidates forum on Monday, Sept. 10, at 2 p.m. at the Coralville Public Library. Lyle Muller, executive director and editor of Iowa Center for Public Affairs Journalism – IowaWatch, will moderate the forum, which will be sponsored by the Johnson County Task Force on Aging. House District #73 — Bobby Kaufman (R) – Jodi Clemens (D). Senate District #37 — Zack Wahls (D) – Carl Krambeck (L). Senate District #39 — Kevin Kinney (D) – Heather Hora (R). Senate District #43 — Joe Bolkcom (D) – Patrick Wronkiewicz (R). Muller will ask questions but also take questions from the audience, submitted on cards. Expected topics include: managed care, tax credits, minimum wage, education, child care, workforce issues, mental health, collective bargaining, women’s issues, long-term care ombudsman, elder abuse, home and community services, nursing homes, caregiver support, housing, transportation and what can the state do to prepare for its aging population.